Businesses installing VoIP Phone systems frequently run into integration issues with peripheral devices such as phone paging, intercoms, loud phone ringers and analog TDM connections. Telcom & Data has announced it has signed an agreement to distribute CyberData’s new innovative SIP-enabled IP Paging and Two-way Communication/Access Control devices that are PoE. There is a real need for these types of two way IP communication devices. 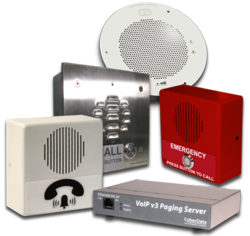 CyberData's new VoIP Phone Paging, intercom, loud phone ringer and IP phone strobes are designed to enhance SMB through Enterprise level VoIP phone system installations. When migrating to VoIP phone systems many analog TDM devices such as phone paging systems, door intercoms, loud phone ringers, phone strobes and other analog devices no longer operate as part of the change over from TDM based phone systems to VoIP. Utilizing Cyberdata's IP technology as part of an overall VoIP phone system solution delivers cutting edge and cost-effective results, and is an essential element of any VoIP phone system installation. CyberData's SIP-enabled IP Paging Endpoints utilize digital communication technology in place of outdated analog technology. This increases reliability and allows a broader range of useful information to be transferred between devices. According to Bill Majerczak, sales manager for Cyberdata, Cyberdata’s success with their product lines lies in it’s ease of set up and use. Every device can be plugged into a POE (power over Ethernet switch) for power and is easily programmed. Devices work with any premised base or hosted IP phone system. Telcom & Data is based in Milwaukee, WI with offices in Chicago and Miami FL. Founded by Ricardo Trinidad in 1996, Telcom & Data now provides communication solutions to over 13,000 business customers around the world. For more information about VoIP communications visit http://www.telcom-data.com.